In a recent paper published in the International Journal of Epidemiology, SRC research assistant professor Hongwei Xu and his colleagues studied how early-life exposure to China’s 1959-1961 famine affected cognitive performance in midlife. They found some support that nutritional deprivation during prenatal and early postnatal periods had negative impact on both the level and the change of cognitive performance among Chinese adults in their 50s. In theory, malnutrition during prenatal and early postnatal period due to exposure to famine may alter the process of brain development, which negatively affects cognitive ability. Such negative effects on cognitive ability can also have a latent period and will only show up in the mid- to old- ages. However, results from previous research based on the 1944-1945 Dutch famine did not support such argument. The Chinese famine that began in 1959 and ended in 1961 were largely attributed to both natural disasters as well as policy mistakes after the onset of Great Leap Forward (GLF) campaign in 1958 (hence the “GLF famine”). Compared to other famines, the GLF famine lasted longer, had a wider geographic scope, and caused a greater death toll. Hence, if prenatal and early life exposure to malnutrition did have adverse effects on cognitive ability, the effect would be more pronounced in the case of the GLF famine. Hongwei and his colleagues reexamined this question using data from the China Health and Retirement Longitudinal Study (CHARLS), a nationally-representative survey of Chinese adults who are aged 45 or older. Samples from multiple cohorts born between 1958 and 1963 in various geographic locations were used, and these cohorts varied in timing, duration, and intensity of exposure to the famine. In particular, people who were born between 1958 and 1963 were exposed to the famine and hence malnutrition in various ways: between birth and year of age three for the 1958 cohort, between in utero and year of age two for the 1959 cohort, between in utero and year of age one for the 1960 cohort, etc. The 1963 cohort, who were not exposed to the GLF famine (including pre- and postnatal periods), were used as a control group. The severity of famine was measured at the prefecture level (the famine hit rural areas harder) and was defined as the difference in mortality between the famine period and the years immediately before/after the famine period. Two waves (2011 and 2013) of the CHARLS data were used, so the researchers could examine the effect of famine on not only the level of mid-life cognitive performance in 2011 but also the change of mid-life cognitive performance between 2011 and 2013. Overall, Hongwei and his colleagues found some, but somewhat limited, support that exposure to famine negatively affected cognition. First, comparing to the 1963 cohort (the control group), the 1961 cohort had lower score in cognitive performance in their mid-lives. Nevertheless, no other cohort born between 1958 and 1962 demonstrated different cognitive score from the control group. Second, the 1959 cohort, who arguably were most adversely affected by the famine, were the only cohort that experienced statistically significant decline in cognitive ability between 2011 and 2013. One plausible explanation to their mixed results is the mortality selection effect. To the extent that the 1958-1961 cohorts were hit the most during the famine, many of them may not have survived long enough to be surveyed in 2011. In other words, people who were hit the most but managed to survive into their 50s were a very selective (i.e. “tougher”) subsample of their birth cohort. Consequently, even though on average famine negatively affected cognitive performance, such effect might not be observed among the “tougher” surviving subsample. However, the negative impact on cognitive decline still exists. This explains why the negative effect of famine on the level of cognitive ability was only observed in the younger cohort (who were not hit as hard) as well as why the negative effect of famine on the change in cognitive ability was only observed among the 1959 cohort (who were hit the hardest). Hongwei Xu, Zhenmei Zhang, Lydia Li, Jinyu Liu (2018). 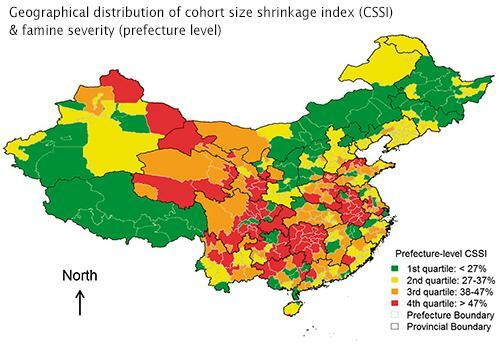 Early life exposure to China’s 1959–61 famine and midlife cognition. International Journal of Epidemiology, 47(1): 109-120.